Cambodia has a land area of 181,035 square kilometers in the southwestern part of the Indochina peninsula, about 20 percent of which is used for agriculture. It lies completely within the tropics with its southern most points slightly more than 10° above the Equator. The country capital city is Phnom Penh. International borders are shared with Thailand and the Lao People’s Democratic Republic on the West and the North, and the Social Republic of Viet Nam on the East and the Southeast. The country is bounded on the Southeast by the Gulf of Thailand. In comparison with neighbors, Cambodia is a geographical contact country administratively composed of 20 provinces, three of which have relatively short maritime boundaries, 2 municipalities, 172 districts, and 1,547 communes. The country has a coastline of 435 km and extensive mangrove stands, some of which are relatively undisturbed. The dominant features of the Cambodian landscape are the large, almost generally located, Tonle Sap (Great Lake) and the Bassac River Systems and the Mekong River, which crosses the country from North to South. Surrounding the Central Plains which covered three quarters of the country’s area are the more densely forested and sparsely populated highlands, comprising: the Elephant Mountains and Cardamom Mountain of the southwest and western regions; the Dangrek Mountains of the North adjoining of the Korat Plateau of Thailand; and Rattanakiri Plateau and Chhlong highlands on the east merging with the Central Highlands of Viet Nam. The Tonle Sap Basin-Mekong Lowlands region consists mainly of plains with elevations generally of less than 100 meters. As the elevation increases, the terrain becomes more rolling and dissected. The Cardamom Mountains in the southwest rise to more than 1,500 meters and is oriented generally in a northwest-southeast direction. The highest mountain in Cambodia –Phnom Aural, at 1.771meters – is in the eastern part of this range. The Elephant Range, an extension of Cardamom Mountains, runs towards the south and the southeast and rises to elevations of between 500 and 1,000 meters. These two range are bordered on the west are narrow coastal plain facing the gulf of Thailand that contains Kampong Som Bay. The Dangrek Mountains at the northern rim of Tonle Sap Basin, consisting of a steep escarpment on the southern edge of the Korat Plateau in Thailand, marks the boundary between Thailand and Cambodia. The average elevation of about 500 meters with the highest points reaching more than 700 meters. Between the northern part of the Cardamom ranges and the western part of the Dangrek, lies and extension of the Tonle Sap Basin that merges into the plains in Thailand, allowing easy accesses from the border of Bangkok. The Mekong River Cambodia’s largest river, dominates the hydrology of the country. The river originates in mainland China, flows through Myanmar, Laos, Thailand before entering Cambodia. At Phnom Penh, with alternative arms, the Bassak River from the south, and the Tonle Sap River linking with the ” Great Lake ” itself –Tonle Sap – form northwest. It continues further southeastward to its lower delta in Viet Nam and to the South China Sea. The section of Mekong River passing through Cambodia lies within the topical wet and dry zone. It has a pronounced dry season during the Northern Hemisphere winter, with about 80 percent of the annual rainfall occurring during the southwest monsoon in May-October. The Mekong River average annual flow at Kratié of 441 km3 is estimated as 93 percent of the total Mekong run-off discharge into the sea. The discharge at Kratié ranges from a minimum of 1,250m3/s to the maximum 66,700m3/s. The role of Tonle Sap as a buffer of the Mekong River system floods and the source of beneficial dry season flows warrants explanation. The Mekong River swells with waters during the monsoon reaching a flood discharge of 40,000m3/s at Phnom Penh. By about mid-June, the flow of Mekong and the Bassak River fed by monsoon rains increases to a point where its outlets through the delta cannot handle the enormous volume of water, flooding extensive adjacent floodplains for 4-7 months. At this point, instead of overflowing its backs, its floodwaters reserve the flow of the Tonle Sap River (about 120 km in length), which then has the maximum inflow rate of 1.8m/s and enters the Grate Lake, the largest natural lake in Southeast Asia, increasing the size of the lake from about 2,600 km2 to 10,00 km2 and exceptionally to 13,000 km2 and raising the water level by and average 7m at the height of the flooding. This specificity of the Tonle Sap makes it the only “river with return ” in the world. After the Mekong’s water crest (when its downstream channels can handle the volume of water), the flow reverses and water flows out of the engorged lake. The Great Lake then acts as a natural flood retention basin. When the floods subside, water starts flowing out of the Great Lake, reaching a maximum outflow rate of 2.0m/s and, over the dry season, increase mainstream flows by about 16 percent, thus helping to reduce salinity intrusion in the lower Mekong Delta in Viet Nam. By the time the lake water level drops to its minimum surface size, a band 20-30 km wide of inundate forest is left dry with deposits of a new layer of sediment. This forest, which is of great significance for fish, is now greatly reduced in size through salvation and deforestation. The area flood around Phnom Penh and down to the Vietnamese border is about 7,000 km2. 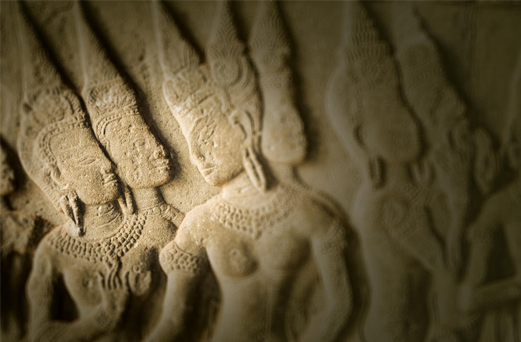 * Preah-reach-ana-chak Kampuchea – is the official name used by the Royal Government of Cambodia. It means, the Kingdom of Kampuchea. * Ana – derived from Pali It means Authority or Power. * Srok Khmer (local short form) – common and general used by Khmer People. Srok means Territory. * Pra-Tehs Khmer (local short form) - the formal name and general writing. Pra-Tehs means “Country”. * Pra-Tehs Kampuchea (local short form)– Kampuchea was derived from Sanskrit word as Kambuja.